Brain on Fire by Susannah Cahalan accounts Cahalan’s battle with autoimmune encephalitis. Though is the memoir one of medicine or psychology? 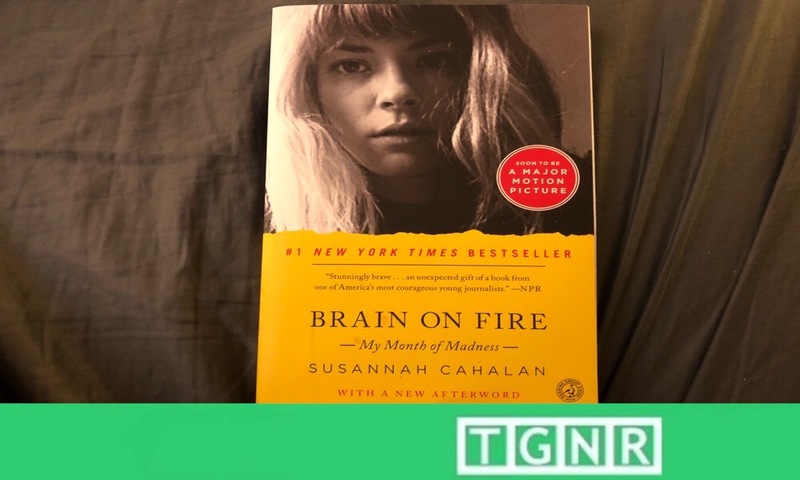 In this installation of Neuronomics, Kristen E. Strubberg reviews the 2012 New York Times bestselling autobiography Brain on Fire: My Month of Madness, by New York Post writer Susannah Cahalan. In June of 2018, Netflix adapted Brain on Fire to film staring Chloë Grace Moretz. As an eminent student of the human brain, Kristen breaks down this much appraised journey into Cahalan’s rare disease. When I went to find a copy of Brain on Fire at what is generously called a book store during these dark digital days, I wove through the aisles to the psychology section. To my sense of order and categorization and based on my knowledge of what the book was about – a memoir of “madness” – psychology seemed appropriate. I traced the shelves until I came to the crammed corner of testimonials, as I think of them, given far too little space. I run the titles once, twice, it’s not there. Then, on the shelf above I find a copy flaunting a cover that doubles as an advert for the Netflix adaptation. But this is the only copy, out of place, no tell-tale gap in the spines from whence it came. I contemplate settling for the “tie-in” edition, but I’m curious where the other copies are? It is a highly relevent, relatively new book – where are her sisters? Not on the new release carousal, I already inspected that display. Thinking again about the book’s story, I realize there is only one other place it could be. I stride a few rows behind Psychology to medicine and there, neatly in row and occupying space only allotted to new and revenue pumping titles, I find the original edition. But why medicine? This a memoir of “madness,” is it not? Albeit one with a very neurological component, but what psychological malady doesn’t have some roots in the grey matter between the ears? Brain on Fire: Medicine or Psychology? As I begun to read, I realized that of the two classifications, medicine is the closer fit for this hybrid retelling of one women’s month from hell. Brain on Fire is more mystery than traditional memoir. Author Susannah Cahalan keeps the reader engaged as her family and rotating team of specialists struggles to diagnose an elusive ailment that has deranged her mind and convulsed her body. Throughout the narrative of her harrowing days of illness however, I felt detached from the Susannah whose brain was burning from anti-NDMA receptor autoimmune encephalitis. This is not unlike Susannah the author. Mostly, this is due to to the fact that the author/narrator remembers very little of the actual illness at its apex. What is Anti-NDMA Receptor Autoimmune Encephalitis? The NDMA receptor, the target of her self-attacking immune system, is found throughout the cerebral cortex, home of the brain’s higher functions. As these important receptors became increasingly destroyed by wayward immune cells, the reader can see Susannah’s cognitive function being stripped away as the disease progresses. Following Susannah’s symptoms, it’s not surprising to learn that the second highest concentration NMDA receptors is the hippocampus, the brain region responsible for consolidating a person’s experiences into memory. With this vital memory-maker also being besieged by this disease, the fact that her recall from her time in the hospital remains inaccessible fits the picture of her illness. All the stories and descriptions are second hand accounts from family and Cahalan’s medical records. While a blessing for the author – who wants to remember the worst demons unleashed – it sets this book apart from other memoirs of mental illness or neurological trauma. Brain on Fire in some ways bridges V. S. Ramachandran and Oliver Sacks’ neurological mysteries, and the pathos of a brain reassembling after disease such as Lori Schiller’s The Quiet Room. But the second pillar of the bridge has a hole, admitted by the author in her preface, because the emotional torrent associated with the disease is digested retroactively. Albeit from myriad sources composed contemporaneously. Cahalan tries to venture conclusions about self and deeper self, and provides clear neurological scaffolding for the self, but she admittedly is not certain if she can pull any enduring revelations about herself from the ordeal. As such, the book boils down to a medical mystery novel that it is superb accomplishment. However as a window into the deeper truths of the mind, or a catharsis from emotion and personal triumph, it is lacking.